Two years ago Under Armour came out with a combine testing shoe. I could not wait to get my hands on it as it seemed to be the answer to finding a 40 yard dash shoe that was light as a feather, could grip into the turf, and had the engineering of a track shoe. This year I trained Trindon Holliday from LSU who clocked a 4.21 hand held thime at the NFL Combine. Trindon is a track specialist and former NCAA 100m champion. His first question to me was what shoes was he going to wear at the NFL Combine. I pulled out a pair of the Under Armour Combine shoes and his face lit up. He knew he was going to run fast in those shoes. 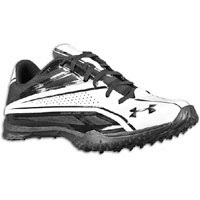 These Under Armour shoes have what they call a negative heel, forcing you to get up on your toes when you run, which makes you run faster. At 8.8 ounces it is hard to find a lighter shoe. Not to mention they are a great shoe to wear for the vertical jump as well. So check these shoes out as they are now available to purchase to the public. Get them here!